Ranked by how silly it sounds when you say someone is "In the pocket of..."
The farming industry: "Big Ag"
The International Equestrian Federation: "Big Horse"
The Board of Podiatric Medicine: "Big Foot"
The mining industry: "Big Hole"
The American Egg Board: "Big Egg"
Alt-text: As far as "being in the pocket of Big Egg" goes, I think the real threat is Chansey. An investigator claims to have discovered in some dusty archives that back in the days when the pilgrims landed each person coming to America from England was required to bring with them eight bushels of corn meal, two bushels of oatmeal, two gallons of vinegar and a gallon each of oil and brandy. In view of the fact that nothing of importance hinges on the truth or falsity of this statement, not much time need be consumed to ascertain whether this is truth or fiction. I have a grudging respect for this 1921 newspaper fact-checker. ポニーテール: Our robot floats using a helium sphere, which is highly charged and can induce lightning strikes. ポニーテール: It moves using a grappling gun like the hook shot from Zelda. 欄外の声: What is the robot for? ポニーテール: It could help with search and rescue after disasters. 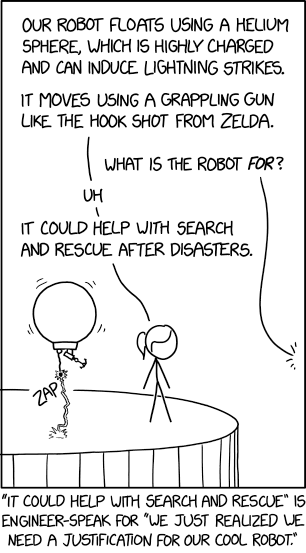 Alt-text: "Some worry that we'll soon have a surplus of search and rescue robots, compared to the number of actual people in situations requiring search and rescue. 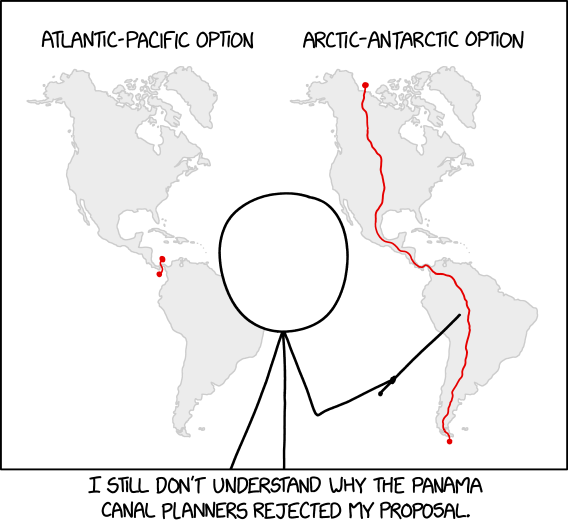 That's where our other robot project comes in..."
I still don't understand why the Panama Canal planners rejected my proposal. Alt-text: Once they selected the other proposal, we could have kept shopping ours around, but we would had to modify it include an aqueduct over their canal, which would be totally unreasonable. Alt-text: It's early 2020. The entire country is gripped with Marco Rubio fever except for Alaska, which is freaking out. You're frantically studying up on etiquette and/or sexting. ポニーテール: All ready for the hearing? Let's go over things one more time. ポニーテール: What is the main reason to fund this mission? 女（黒髪）: It will significantly advance out long-term goal of better understanding the formation and evolution of the Solar System, while fulfulling our mandate to develop a new generation of interplanetary spacecraft. 女（黒髪）: And because it's space! Alt-text: Our grant application contains one of those little greeting card speakers that plays spaceship noises when you open it. 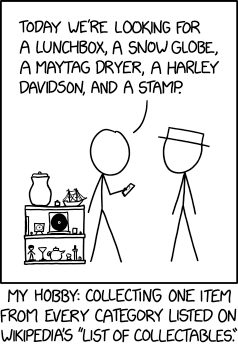 Today we're looking for a lunchbox, a snow globe, a Maytag dryer, a Harley Davidson, and a stamp. My hobby: Collecting one item from every category listed on Wikipedia's "List of collectables." Title text: I'm trying to get the page locked because some jerk keeps adding "Yachts". 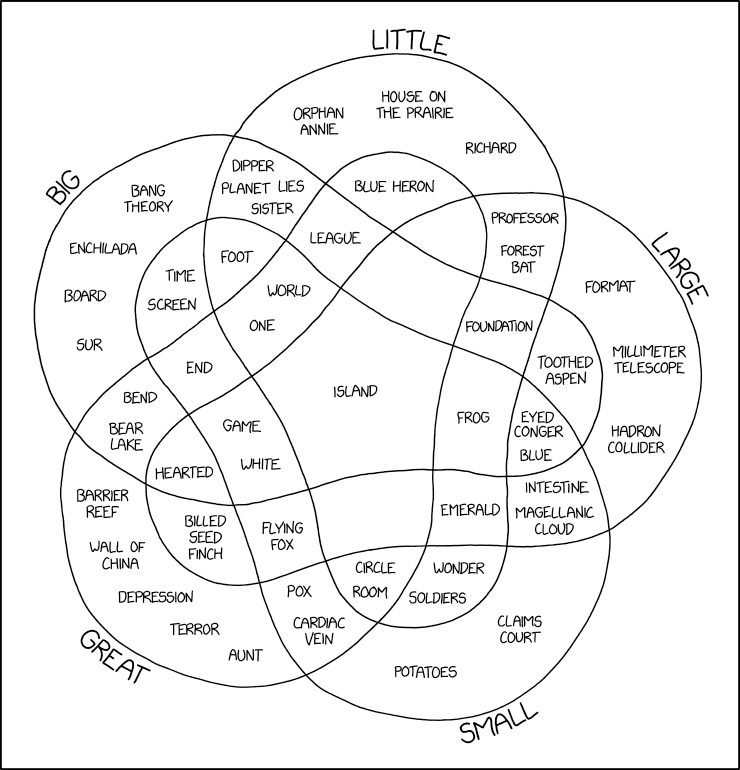 Alt-text: Terms I'm going to start using: The Large Dipper, great potatoes, the Big Hadron Collider, and Large Orphan Annie. Alt-text: It's so sad how almost no one alive today can remember seeing the galactic rainbow, the insanity nebula, or the skull and glowing eyes of the Destroyer of Sagittarius.